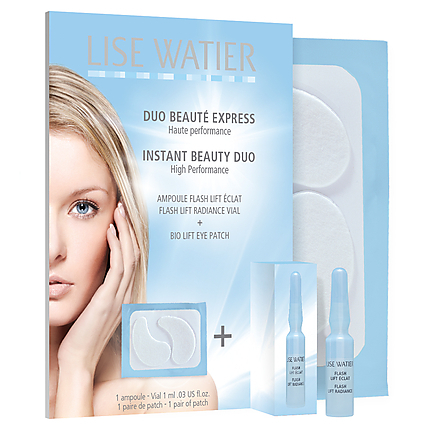 Lise Waiter Instant Beauty Duo : The Perfect pre-wedding/special event face treatment . Lise Waiter has cleverly developed a beauty duo that is perfect for all special occasions. This Beauty duo contains a pair of Lise Watier’s Bio Lift Eye Patches and a Flash Lift Radiance Vial. Both for only $12!!!!! The Flash Lift Radiance Vials can also be purchased on their own, $27 for seven 1ml Vials. The mini duo will help fight signs of fatigue and give you a brighter tighter complexion. The Bio Lift Eye Patch helps tighten up the eye area and diminish under eye circles and puffiness. Visibly reduces fine lines and wrinkles. Smoothes and moisturizes the skin in 15-20min. It contains Soya Phyto-collagen, Aloe, Witch Hazel and Vitamin E.
Flash Lift Radiance Vials are applied before your makeup or after. Flash Lift Radiance Vials provide instant radiance, erases signs of fatigue, smoothes the apperance of wrinkles, a longer lasting makeup and gives a cosmetic lift effect. Perfect for someone who wants dewy, smooth and radiant skin. How it looks/smells/feels: Light watery liquid. Smell is very light and fresh. Instant tightening feeling. ~ by aglowbyjoan on February 25, 2012.